The 2011 conference of the Working-Class Studies Association will be June 22-25 at the University of Illinois’ conference center in Chicago, just southwest of the Loop at 750 S. Halsted Street. Dormitory rooms will be available nearby and public transportation, readily available from both airports. The conference will open with a special event Wednesday evening, June 22, followed by three full days of panels, workshops, and plenaries. Though plans are still developing, the Call for Papers is attached below, with a January 10 deadline for submissions. Please circulate the Call widely in your various academic disciplines and to anyone you think will be interested. As an academic field, Working-Class Studies premises that the working class lacks sufficient power in all aspects of modern life – from financial means to means of expression – and that universities and their scholarly disciplines can help redress inequalities of class power by paying consistent attention to working-class life and experience in all its messy diversity. While including all the traditional themes of previous Working-Class Studies Association conferences, the 2011 Chicago conference will highlight working-class organizations, old and new, and will encourage participants to think about organizational means to enhance working-class power over daily life at work and in the community, in democratic politics and public policy, and in cultural expression. But against this background, we encourage the wild diversity of topics, themes, presentations, and panels that have characterized previous Working-Class Studies conferences. Please try and place your proposal within one of the categories below, as this will help us organize individual presentations into more coherent groups. But as long as your proposal relates to working-class life and experience, don’t hesitate to use the “Other” category at the bottom of our list. Individual presentation, paper, or talk. Panel session or workshop, featuring multiple presenters, proposing jointly. Performance, reading, or screening of creative work. Brief biographical statement and contact information, including mailing and e-mail addresses. Proposals for papers, presentations, and sessions are welcome until January 10, 2011. Notification of acceptance will be made by March 1. Submit proposals electronically to wcsa2011@gmail.com Inquiries and special requests should be directed to Jack Metzgar at the same e-mail address. Closer to the event a web site will be available with full information on registration, travel, lodging, and the program as it develops. The site will include information about how to apply for low-income travel grants and reduced registration fees. The Working Class Studies Conference Site is here. Chinese leaders are unlikely to be impressed by such [U.S. warnings], the language of an imperial power desperately trying to cling to authority it no longer has. Of all the “threats” to world order, the most consistent is democracy, unless it is under imperial control, and more generally, the assertion of independence. These fears have guided imperial power throughout history. In South America, Washington’s traditional backyard, the subjects are increasingly disobedient. Their steps toward independence advanced further in February with the formation of the Community of Latin American and Caribbean States, which includes all states in the hemisphere apart from the U.S. and Canada. For the first time since the Spanish and Portuguese conquests 500 years ago, South America is moving toward integration, a prerequisite to independence. It is also beginning to address the internal scandal of a continent that is endowed with rich resources but dominated by tiny islands of wealthy elites in a sea of misery. Furthermore, South-South relations are developing, with China playing a leading role, both as a consumer of raw materials and as an investor. Its influence is growing rapidly and has surpassed the United States’ in some resource-rich countries. Correspondingly, loss of control would threaten the project of global dominance. By the 1970s, the major producers nationalized their hydrocarbon reserves, but the West retained substantial influence. In 1979, Iran was “lost” with the overthrow of the shah’s dictatorship, which had been imposed by a U.S.-U.K. military coup in 1953 to ensure that this prize would remain in the proper hands. By now, however, control is slipping away even among the traditional U.S. clients. The largest hydrocarbon reserves are in Saudi Arabia, a U.S. dependency ever since the U.S. displaced Britain there in a mini-war conducted during World War II. The U.S. remains by far the largest investor in Saudi Arabia and its major trading partner, and Saudi Arabia helps support the U.S. economy via investments. However, more than half of Saudi oil exports now go to Asia, and its plans for growth face east. The same may be turn out to be true of Iraq, the country with the second-largest reserves, if it can rebuild from the massive destruction of the murderous U.S.-U.K. sanctions and the invasion. And U.S. policies are driving Iran, the third major producer, in the same direction. China is now the largest importer of Middle Eastern oil and the largest exporter to the region, replacing the United States. Trade relations are growing fast, doubling in the past five years. The implications for world order are significant, as is the quiet rise of the Shanghai Cooperation Organization, which includes much of Asia but has banned the U.S.—potentially “a new energy cartel involving both producers and consumers,” observes economist Stephen King, author of Losing Control: The Emerging Threats to Western Prosperity. In Western policy-making circles and among political commentators, 2010 is called “the year of Iran.” The Iranian threat is considered to pose the greatest danger to world order and to be the primary focus of U.S. foreign policy, with Europe trailing along politely as usual. It is officially recognized that the threat is not military: Rather, it is the threat of independence. To maintain “stability” the U.S. has imposed harsh sanctions on Iran, but outside of Europe, few are paying attention. The nonaligned countries—most of the world—have strongly opposed U.S. policy toward Iran for years. Nearby Turkey and Pakistan are constructing new pipelines to Iran, and trade is increasing. Arab public opinion is so enraged by Western policies that a majority even favor Iran’s development of nuclear weapons. The conflict benefits China. “China’s investors and traders are now filling a vacuum in Iran as businesses from many other nations, especially in Europe, pull out,” Clayton Jones reports in The Christian Science Monitor. In particular, China is expanding its dominant role in Iran’s energy industries. Washington is reacting with a touch of desperation. In August, the State Department warned that “If China wants to do business around the world it will also have to protect its own reputation, and if you acquire a reputation as a country that is willing to skirt and evade international responsibilities that will have a long-term impact … their international responsibilities are clear”—namely, to follow U.S. orders. Chinese leaders are unlikely to be impressed by such talk, the language of an imperial power desperately trying to cling to authority it no longer has. A far greater threat to imperial dominance than Iran is China’s refusing to obey orders—and indeed, as a major and growing power, dismissing them with contempt. This is the second of two columns by Noam Chomsky about China. In These Times published the first, “China and the New World Order,” in September. 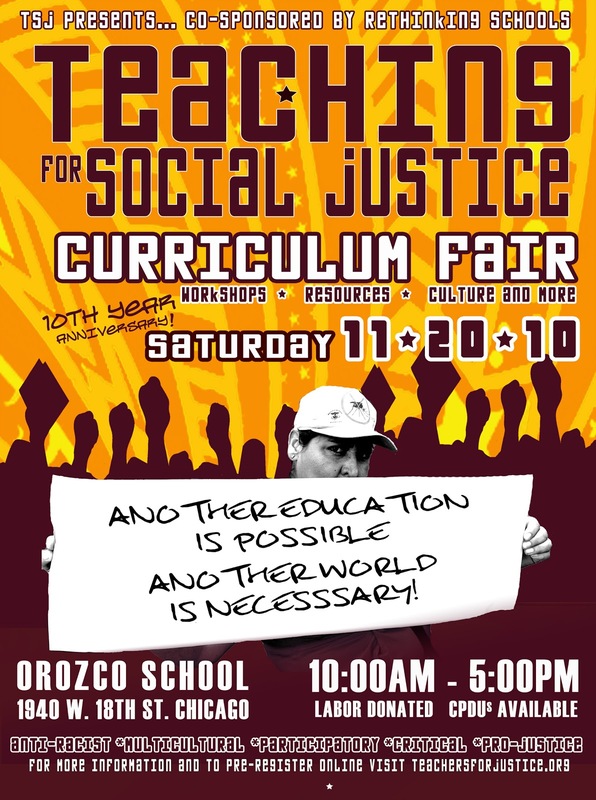 10th Annual Teaching for Social Justice Curriculum Fair, Nov. 20, 2010! 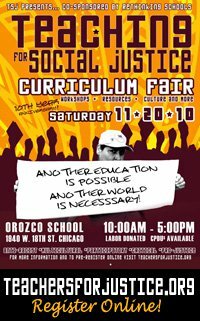 In “science fair” format, and completely grassroots volunteer-organized, the Curriculum Fair will provide over 600 educators, activists, parents, youth & community members with a space to share curricula, ideas & resources. We’ll be making friends & building relationships, exploring ideas & projects, connecting our histories & struggles. All in a spirit of social justice and education for liberation. K-12 Teachers will be on hand with poster-board visuals to discuss their favorite curriculum (please sign up! ), local & national organizations will have tables to share relevant resources & books, and community leaders will be facilitating dialogue through a number of workshops on various & vital issues. And don’t forget the always-uplifting keynote speakers… to be announced soon! We hope you’ll help us shape this space to be accessible for people with disabilities, accommodating to folks with language & dietary needs, and safe for all folks to be their full selves. Register, volunteer, come to a meeting! We’ll appreciate you dearly! Click here for more! [The article below, sent to us by Andy Willis, may, in his words, be short on economic theory but is a passionate argument for getting ourselves together for a future worth seeing. It is hard, however, to make an argument that the choices we have at the ballot box will get us closer to that world. The disenchantment with the change promised by the Democrats 2 years ago is striking, and for good reason. To counter this alienation, President Obama, Michele Obama, Joe Biden and assorted other Democratic leaders are out in the hinterlands trying to enthuse the voters by saying it could have been a whole lot worse if we weren’t in power. Meanwhile the Republicans — the Republicans!! — are faulting the Democrats for the Wall Street bailout and health care legislation that bails out the health care industry. And the “tea party” is banking on anger and confusion throughout America. Massive infusions of money deluge the campaign funds, to spend millions of dollars on a legislative seat for which the salary is . . . $100,000? The money goes toward adverts that produce no new information while bordering on slander and innuendo. “XYZ lied about his war record. . . What else is he lying about?” Well, yeah, what else? Or “After 2 corrupt governors, why do we need a third?” — and, by the way, when did you stop beating your wife? Which one of the corporate manipulated candidates with varying years of political experience is the real . . . outsider? It’s not a circus; clowns are entertaining. If we have learned anything, the Democrats have shown us in the last two years that you can’t get anything done (through the legislative procedure) to benefit the people when you control the presidency and the Congress . In other words, if the Republicans seize control of the House (and in the unlikely possibility they will also gain control of the Senate), they will need the complicity of Democrats to wreak havoc. If experience in the Reagan and Bush years means anything, we can guess they will find that complicity. Perhaps that is the true meaning of the “bipartisanship” that has been so highly touted in Washington. In August 2009, I wrote a piece titled Fascist America: Are We There Yet? that sparked much discussion on both the left and right ends of the blogosphere. In it, I argued that — according to the best scholarship on how fascist regimes emerge — America was on a path that was running much too close to the fail-safe point beyond which no previous democracy has ever been able to turn back from a full-on fascist state. I also noted that the then-emerging Tea Party had a lot of proto-fascist hallmarks, and that it had the potential to become a clear and present danger to the future of our democracy if it ever got enough traction to start winning elections in a big way. On the first anniversary of that article, Jonah Goldberg — the right’s revisionist-in-chief on the subject of fascism — actually used an entire National Review column to taunt me about what he characterized as a failure of prediction. Where’s that fascist state you promised? he hooted. It’s funny he should ask. Because this coming election may, in fact, be a critical turning point on that road. Click here to read the rest of this story. Highlights: DARPA, DARPA crazy; Robotics Rodeo; Call Center Automation; Robotic Teachers; Reports on robot job displacement; positive ways of looking at robot job displacement; piano bot; bowler bot; babies and robots; and antarctic exploration. Robots are already vacuuming our carpets, heading into combat and assisting docs on medical procedures. Get ready for a next generation of “near human” bots that’ll do a lot more: independently perform surgeries, harvest our crops and herd our livestock, and even administer drugs from within our own bodies. Those are only a few of the suggested applications . . .
. . . the automation of customer service as a way to cut costs. A student practices her English pronunciation with a robot as part of South Korea’s robot-learning program. Excellent econ reports on tech impacts on the US economy. The middle class is disappearing and the problem is deeper than politics. How will we understand work in the coming age of robotics? Last April, the MIT economist David Autor published a report that looked at the shifting employment landscape in America. He came to this scary conclusion: Our workforce is splitting in two. The number of high-skill, high-income jobs (think lawyers or research scientists or managers) is growing. So is the number of low-skill, low-income jobs (think food preparation or security guards). Those jobs in the middle? They’re disappearing. Autor calls it “the polarization of job opportunities.” These days, all of us, from President Obama on down, are thinking about jobs. The unemployment rate is hovering around 10 percent, we’ve watched the ground disappear from under Detroit and Wall Street, and there’s a pervading sense that other industries might be next. It’s not that the issue isn’t getting attention. The Princeton economist Paul Krugman is out there telling Congress to spend more money to create jobs. The former secretary of labor Robert Reich is arguing for tax breaks for the bottom brackets so people can buy stuff again. Here’s the thing, though: The erosion of the middle class is a phenomenon that’s bigger than the Great Recession. Middle-range jobs have been getting scarcer since the late 1970s, and wages for the ones that are still around have remained stagnant. Anti-robot sentiments are on the rise. There’s a lot of chatter online right now about a study published by MIT economist David Autor. In a nutshell, Autor states that while American manufacturing is strong, middle class jobs are dying out and robots are to blame. . . . A closer look at the issue doesn’t have to result in a doom and gloom response. Ultimately, robots offer opportunities to keep and create new and better jobs for Americans. This is from a regular conversation between Diane Ravitch and Deborah Meier in the Bridging Differences columns of Education Week. The responses to this article have been fascinating. Some have criticized the use of the term “manifesto,” because a manifesto is usually a declaration of belief by those who are out of power, not by those who hold power. Think, for example, of the Declaration of Independence as a manifesto, though certainly it outclasses the superintendents’ manifesto in gravity and significance! Then there is the Communist Manifesto, which sought to rally the workers of the world to take power. Then there was the Unabomber Manifesto, a screed against technology by deranged mathematician Ted Kaczynski, who managed to kill three people and maim 23 others. In 1962, student activists issued the Port Huron Statement, the manifesto of the Students for a Democratic Society, which called upon the youth of their generation to act against social injustice. The superintendents’ manifesto does not come from the powerless. It was written by men and women who are in charge of major school systems and who certainly have far more power than parents, teachers, principals, or ordinary citizens. What are their basic principles? The superintendents want the public schools to operate according to market principles. Their manifesto is a companion piece to the film “Waiting for ‘Superman. '” Like the film, the authors of the manifesto want to be free of the rules governing the hiring and firing of teachers. They believe that teachers alone are responsible for whether students do well or poorly in school. They believe that poverty has no bearing on student achievement: Only the teacher matters. They want merit pay. They want more data by which to judge teachers and students. They want more online instruction. And they want more charter schools so that more children can escape the inadequate schools for which they are responsible as superintendents. Read the rest of this article by clicking here. You offer the perfect response. The fact that some of the usual suspects are divided on the “bash the teachers” agenda is good news. It gives us new sources of hope. And I remember that even in a flawed democracy like ours (and is there an un-flawed one? ), neither “we” nor “they” can ever declare a total victory. When I came to New York City in the fall of ’65 my friends and acquaintances (like the real estate agent who was helping me locate an apartment) told me that “no one sends their kids to the public schools.” Of course, 1.2 million children couldn’t all have been orphans, but I understood the code. I hadn’t taken it for granted, since my kids had been OK at their prior public schools in Chicago’s South Side and Philadelphia’s West Mount Airy. So my children spent their pre-college years in NYC’s public schools. I grew accustomed to the guilt trips I listened to from folks like Davis Guggenheim, who tells us that “Waiting for Superman” was made to assuage his guilt. Guggenheim—who also made the film “An Inconvenient Truth”—doesn’t explain in plain language what it was he couldn’t tolerate in the public schools in his neighborhood (or exactly what that neighborhood was). He seemed to have some concern about tracking in public schools. But apparently he was not uncomfortable with the fact that the school where he sent his child was not (probably) open to just anyone who could afford it, but had its own way of pre-sorting the kids: money—and high scores. This background helps me understand the animus of his attack on teachers and unions. It’s perhaps too much to ask him why there are even worse results in the many states in which there are no teachers’ union contracts! He doesn’t tell us, either, whether he’d send his daughter to the schools he highlights, or the ways in which they do and do not resemble his children’s private schools. But I do know how different Washington’s Sidwell Friends (which Malia and Sasha Obama attend, and apparently Guggenheim did, as well!) is from the charter schools he glorifies in his film. Read the rest of this story by clicking here. from Rock & Rap Confidential comes this report . . . The September 13 issue of Forbes, the business magazine owned by Bono, has an article by Rhodes College professor Art Carden entitled “Scrap the Minimum Wage.” Carden claims that the minimum wage, which is in itself almost impossible to live on, “has only destroyed jobs.” Surprisingly, Carden doesn’t volunteer to work for less than the minimum wage himself. According to his theory, this would create several new jobs in the poverty-stricken city of Memphis where he lives.